Proven strategy. Consistent risk adjusted returns. As demographics shift and life expectancy increases, the demand for high quality and affordable fixed-income products will continue to grow. Top advisors, like you, are always in search of money management firms that can produce strong and reliable performance for clients at any age—in any market circumstances. That’s where Dupree Mutual Funds can help. We are highly focused specialists offering no-load, tax-free, AMT-free municipal bond funds. In fact, that’s all we have done since 1979 when we opened the Kentucky Tax-Free Income Series, which is the third oldest single-state tax-free fund in the U.S. Over thirty-eight years later we are still doing what we have always done-providing investors a low-cost way to earn tax-free income with the added benefit of a professionally managed portfolio. We have been helping investors in Kentucky since 1979 and today we also offer the same expertise to investors through our funds in Alabama, Mississippi, North Carolina, and Tennessee. At Dupree, we do one thing and we do it well: offer investment grade no-load municipal bond funds that offer the benefit of professional portfolio management. What makes our approach unique is the consistency we apply to every aspect of our business. Since 1979, we have consistently followed a disciplined investment strategy intended to consistently generate attractive risk-adjusted returns while keeping fees low. We always strive to deliver outstanding customer service to our shareholders and advisors. It’s a powerful combination that serves our investors and advisors well. We know the municipal bond market inside and out. Over the years, we’ve built strong local, regional and national relationships in the municipal bond business that give us a leg up on our competitors. All of our investment portfolios are actively managed by seasoned portfolio managers that are familiar with the many nuances of the municipal bond market. It is no secret that the municipal bond market is very opaque, so this is where we can really add value for our investors and advisors. For instance, we can see when bonds are overpriced or mispriced in the market due to secondary markups. Since this is the only sector of the investment market in which we participate, we have seen every nuance there is when it comes to buying and selling bonds. We know what we want and more importantly, what we don’t want each time we buy a bond. That’s why it is critical to have a professional manager, with many years of experience in our specific markets, to help you and your clients navigate the market. We also take pride in providing superior customer service and treating our advisors and shareholders like family. Accessibility is key to these relationships. That’s why we offer advisors and investors the opportunity to speak with the same Dupree registered representative every time they call. We are also happy to arrange discussions with our portfolio managers and members of our management. These little personal touches have been making a big difference for over 38 years. And our shareholders appreciate it: 90% of our business comes through word-of-mouth. At Dupree, our owners and management, “eat their own home cooking”. Consequently, we have a vested interest in the success of the firm’s offerings because we invest right alongside our shareholders. The portfolio decisions we make are based on our desire to create shared success and strong financial futures. That is a commitment that you and your clients will always be able to count on. For each fund with at least a three-year history, Morningstar calculates a Morningstar Rating based on a Morningstar Risk-Adjusted Return measure that accounts for variation in a fund’s monthly performance (including the effects of sales charges, loads, and redemption fees), placing more emphasis on downward variations and rewarding consistent performance. The top 10% of funds in each category receive 5 stars, the next 22.5% receive 4 stars, the next 35% receive 3 stars, the next 22.5% receive 2 stars and the bottom 10% receive 1 star. (Each share class is counted as a fraction of one fund within this scale and rated separately, which may cause slight variations in the distribution percentages.) The Overall Morningstar Rating for a fund is derived from a weighted average of the performance figures associated with its three-, five- and ten-year (if applicable) Morningstar Rating metrics. Past performance is no guarantee of future results. Morningstar, Inc. All Rights Reserved. The information contained herein: (1) is proprietary to Morningstar; (2) may not be copied or distributed; and (3) is not warranted to be accurate, complete or timely. Neither Morningstar nor its content providers are responsible for any damages or losses arising from any use of this information. Past performance is no guarantee of future results. At Dupree we diligently adhere to a straightforward two-part investment strategy that has served our shareholders well since 1979: focus on the tangible and excel at the intangible. This strategy is based on the investing philosophy created by our founder, Tom Dupree, Sr.
Buy and hold the highest quality investment grade bonds, with higher institutional coupons, which provide better price protection in volatile interest environments. Maximize tax-free income for our investors and minimize expenses associated with trading. Bonds issued for Essential Services such as water, sewer and schools – these are the types of bonds that most often meet the stringent criteria for our funds. 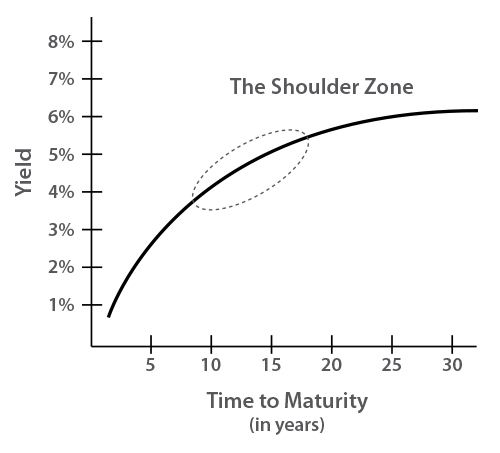 (Explanation of the Shoulder Zone) As the interest rate yield curve begins to flatten out, each increment of additional return comes at a greater cost or higher level of risk. By maintaining our focus on high quality investment grade bonds on the shoulder of the yield curve, we strive for the highest return with the least amount of risk. We buy bonds in the primary market, whenever possible and secondary market through our extensive network of bond dealers and investment advisors to municipalities. At Dupree, we believe that personal investing should be personal and that it all starts with the relationships we have built over the years. We have been actively engaged in the municipal bond space for close to 40 years having built strong relationships with many market participants along the way. We are well known as an institutional buyer always looking for bonds in our markets. We’ve taken the time to get to know the right people at the most local levels of the market, which has given us the advantage of knowing where to look for the bonds we are seeking. So whether it is a trading desk in New York City or a local municipality in Kentucky, Tennessee, North Carolina, Alabama or Mississippi we know where to find the right bonds that fit our criteria. Our mastery of the tangible and intangible aspects of the municipal bond business creates a win-win for all involved.